I’ve been interested in plant medicine for around 4 years, but I never considered myself to be truly passionate until now. Any free time I have, I’m spending time with medicinal plants. Whether it’s watching videos about them, studying them in the wild, wildcrafting them, or making medicine with them, I just want to know everything about all the plants! Here's my bunch of wildflowers that I picked from the roadside to try and identify - fireweed is the beautiful tall purple one. Fireweed is a plant that I felt a deep connection to before even knowing what she was. By the way, I will be referring to plants (like fireweed) as “she” because to me, fireweed (and other plants in general) are not “its.” To me, an “it” is an inanimate object, whereas fireweed is alive, she is a healer, a food source for pollinators, and so much more. I first saw fireweed on a road trip, I noticed beautiful purple patches of wildflowers along the roadside. We pulled over so I could pick some to try and identify what she was. I ended up not looking into it until I saw her again around a month later. The way I like to study plants is probably different than most people. Instead of learning about multiple different plants at once, I like to focus on one single plant ally and soak up everything I can learn about them. So for fireweed, I watched every single YouTube video on her, read blog posts about her, and opened the index of my herbal books to read the pages that discussed her medicinal properties. I found that there wasn’t an overwhelming amount of information about this plant, especially compared to other plant allies. So I decided to write a blog post compiling every single bit of information that I’ve learned about fireweed these past few weeks. It will basically be a comprehensive guide. Honestly, this is mostly for my benefit because I know it will help me in the future, but if it helps teach others about this beautiful plant along the way, that’s my ultimate goal. Right now I’m sitting at a picnic table at a campsite that we drove to around 2 hours ago. I just wildcrafted some fireweed which is currently hanging in a mesh bag from a tree in front of me. It’s the perfect setting to write this blog post! In case you didn't know, wildcrafting is the act of harvesting plants from their natural habitat, for medicinal or food purposes. Here is literally everything that I have learned about this incredible plant. Fireweed is a plant that many people view as a weed, but she’s gorgeous enough to be in any flower garden. She also goes by the name Rosebay Willowherb (mostly in the U.K. though). This is because the leaves resemble willow. The scientific name is Chamerion angustifolium. Fireweed is a very soothing plant for both the earth and our bodies. Whenever the earth is scarred, she is one of the first plants to appear. Fireweed is definitely a pioneer species - this means that she colonizes spots of the bare earth after disturbances like fires, or even when the environment is too harsh in general for other plants to grow. Forest fires are the perfect example because she is one of the first plants to come back after one. Hence the name FIREweed. As long as there’s an open space with lots of sunlight, fireweed thrives. You’ll rarely see fireweed standing alone. Wherever you see one plant, there’s likely a thriving community of them. They are all connected through their lateral roots, and if you’ve ever seen a patch of fireweed, you know how stunning it is. You can see these strong violet-pink communities of fireweed along roadsides and more. Huge patches of fireweed are truly breathtaking. Identification for any plant is super important to me - I always want to be 100% sure that I’m looking at the correct plant. Fireweed has one stem that grows all the way to the very top of the plant. She will look a bit different in each season. In the Spring, the young shoots are green with small leaves. Once summer starts, she begins to flower. The flower has 4 rounded pink, magenta, or rose-purple petals. They all have 8 even-length stamens, with a 4 lobed stigma. I’ll attach a little flower diagram so you know exactly what you’re looking for. The flowers are paper-thin, they almost look luminescent. The buds are droopy. Here's a close up of a fireweed flower - 4 petals, 8 stamens, and it's hard to see but the stigma has 4 lobes. The leaves of fireweed are long and narrow. They are alternate and resemble willow. The leaves can be up to 15 cm in length, obviously the older the plant is, the larger the leaves will be. The leaves should have a white central vein that extends out to the tip of the leaf. The leaves are dark green on the top, and silvery below. There’s an easy way to identify fireweed leaves which is especially useful if the plant has no flowers on it. The lateral leaf veins don’t extend all the way to the outer edge of the leaf. Instead, they loop together near the edge of the leaf, leaving a little border. This pattern of circular and looped veins will be helpful for identifying in the spring. Fireweed grows pretty tall, anywhere from 1-7 feet. It’s now August, and the fireweed here is taller than me! Closer to the fall, the leaves change color and flowers disappear. It's easy to see why the plant is called fireweed in the fall, because from the leaves to her seed pods, it looks like the plant is on fire with all her beautiful colours. Here are photos of both the backside of the leaf (left photo) and the top of the leaf (right photo). You can see the central white vein on each side, along with the circular looped veins. You can also see how the bottom of the leaf is duller compared to the darker green top leaf. Here you can see the seed pods - some are light green, some reddish brown. All facing upwards. Fireweed also has linear seed capsules which are long and narrow. They contain hundreds of seeds. They are green early in the season but turn reddish brown once the seeds start to come out. The seeds are a cotton-like substance. The way fireweed blooms is so unique that I decided it needed its own section. The blooming period is from June to late August. I love how she blooms all summer long. Unlike most other plants, fireweed blooms on the bottom of the stem first, working her way up towards the top. Early in the summer, the first blooms will appear midway up the stem, wherever the leaves stop. Throughout the summer, she will continue to bloom upwards, until she reaches the very top. Each successive flower blooms just above the one before it. Once the last flowers are blooming at the top of the stalk, some of the earliest blooms start seeding. This is when they will turn into a cottony substance. Many people use fireweed to predict when the winter will come. Once the blooms reach the very top, people use that as an indicator that the first snow is soon. Alaskans say there are 6 weeks until winter begins at that point. 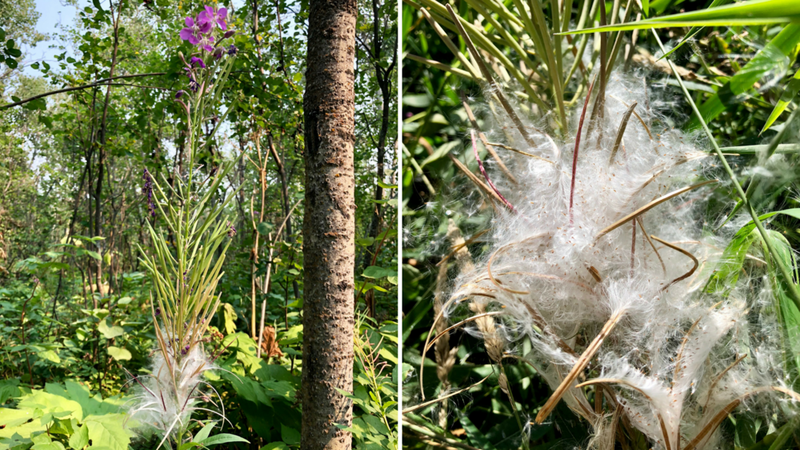 The left photo shows all stages of the fireweed plant. At the very top, you see the last of the blooms, in the middle, you see some seed pods, and at the bottom, you see that some have already opened to spread their cotton-like seeds. The photo on the right shows a close up of the seeds. Fireweed seeds are also something that I thought deserved a section of their own. Towards the end of the season, the upright linear seed capsules split from the top and curl open. It holds hundreds of tiny brown seeds. Each linear seed capsule can hold 300-400 seeds. This means there’s up to 80,000 seeds per plant! That amazes me. The reason the seeds are cotton-like is because they are full of silky hairs to help take them far and wide with the wind. This helps fireweed to become a dominant species on any disturbed ground. They can begin their new life wherever they land. Once the seeds are established, the plants can spread extensively through their underground roots. Even one single fireweed plant can eventually form a large community. The average time for peak colonization is 5 years, after that fireweed is usually replaced by larger growing trees and bushes. However, seeds can stay viable in the soil seed bank for years. So, if a new fire or disturbance (like clear-cutting) happens that opens the ground to light, the seeds can then germinate. Fireweed is found in open areas that aren’t covered with tree canopies. It’s common to find her in disturbed areas like clear-cut forests, burned forests, woodland edges, railroad embankments, oil fields, ditches, and near mountains. Anywhere with lots of sunlight, she thrives. You can find fireweed in the western-northern USA and throughout most of Canada. She’s also in Northern Europe, Asia, and some of North Africa. Wildcrafting fireweed in a provincial park near my house. This photo gives a good reference to how tall fireweed can grow! The entire fireweed plant can be used for food and medicine. This includes the leaves, flowers, buds, stalk, and roots. I’ll talk about how to use each of these parts for food or medicine soon! When I first got into plant medicine, I didn't even think of the fact that there are optimal and not-so-optimal times to harvest plants. For harvesting fireweed leaves, it’s best to do it when the flowers are in bloom. Apparently, if you harvest towards the bottom of the plant, the leaves aren’t as bitter. The leaves will taste best in the spring or mid-summer. You can harvest the flowers throughout the entire bloom period. The roots should be harvested either in the early spring or late fall. As long as there are no flowers, you can harvest the root. If you’re harvesting the shoots, those should be foraged in the early spring, before the plant flowers. They should be anywhere from 6-12 inches high. Fireweed is good for many things ranging from skin health to prostate health. The leaves are high in vitamin A, C, riboflavin, calcium, potassium, manganese, and iron. The leaves have more vitamin C than any citrus fruit and even more vitamin C than rosehips. If fireweed is grown in a northern area, she will have more vitamin C than fireweed grown in warmer areas. She contains the following antioxidants in the leaves: myricetin, quercetins, kaempferol, caffeic acid, cinnamic acid, catechins, chlorogenic acid, palmitate acid, and tannins. She’s very anti-inflammatory. If you use enough, fireweed can help remove headaches. This plant ally is very good for digestive issues, especially because of all the antioxidants. This includes irritable bowel syndrome, any chronic colon condition, and stomach aches. Basically, any inflammation in the digestive system, she can help with. The root has been used in the past for prostate and general male health. Fireweed has also been used for mouth ulcers. Fireweed has lots of mucilaginous qualities. Mucilaginous herbs are full of polysaccharides that have a “slippery” taste. A good example for reference is okra. These polysaccharides swell in water and turn into a type of gel. This is very soothing and protective for any irritated area, such as the digestive system. The mucilaginous properties of fireweed are really good for diarrhea or constipation. Fireweed has soothing, astringent and tonic actions that are also beneficial for enteritis, cholera infantum, or typhoid dysentery. She’s also useful for whooping cough, colds, laryngitis, and bladder/kidney disorders. The leaves and flowers are both very soothing for your skin, which is why you might see fireweed in some natural skin care products. She helps with soothing skin issues like eczema, psoriasis, acne, rashes, ulcers, burns, and any wounds in general. Both the leaves and flowers can be macerated in oil, and you can make a salve or ointment from the infused oil. Stay tuned for a blog post on this! Fireweed flowers can be infused and gargled for a sore throat, pharyngitis, and laryngitis. Fireweed is also beneficial for conditions like arthritis, tooth pain, and the ability to expel intestinal parasites. She can even help reduce the non-cancerous enlargement of the prostate gland (benign prostatic hyperplasia or BPH). In terms of herbal energetics, the fireweed leaves are very cooling and drying. Therefore, they’re soothing to hot and damp conditions. Here are the following herbal actions that fireweed falls under: demulcent, tonic, antispasmodic, anti-tumor, astringent, anti-diarrhea, soothes cough, anti-inflammatory, antiviral, antibacterial, antifungal, analgesic, neuroprotective, alterative, and emollient. Fireweed is also very antibacterial. She has proven antibacterial actions against the following: Pseudomonas pyocyanea, Candida albicans, Staphylococcus albus and Staphylococcus aureus, Bacillus subtilis, Escherichia coli, Mycobacterium smegmatis, Shigella flexneri, Shigella sonnei. I really liked the explanation that Elise gave about fireweed and how it affects our digestive system. She worded it way better than I can! "When I think of fireweed I think of building strong digestive tone. What does this mean? Remember how fireweed comes into a clear cut or burn and creates an environment that will sustain a strong plant community – not just its own species, but pioneering the process to rebuilding a healthy ecosystem? Fireweed leaf tea works on our small intestine and colon in a similar way to create a healthy environment where beneficial digestive bacteria can flourish, nutrients can flow into our body, and waste products can easily move out. It supports our intestines in discriminating between what we need to absorb and what we need to let go of. This helps keep our whole system in a state of balance. Research shows that our guts are an important part of immune function and other aspects of our health. If they are functioning poorly due to imbalanced flora, inflammation, improper food absorption or food moving through at the wrong speed, many things can go awry. Think of fireweed as a soothing friend to the constant work of digestion. Lets break down how fireweed works. It is a gentle, yet effective anti-inflammatory that helps conditions including diarrhea, stomach and intestinal inflammation. Tannins in fireweed act as an astringent. By improving the tone of the colon, it slows water from being reabsorbed and can act as a mild laxative. Herbalist Michael Moore taught that fireweed is also very useful in treating people with Candida overgrowth in their intestines. It has antifungal properties and also helps to normalize the flora of the gut. As previously mentioned, fireweed is high in mucilage. Spring shoots have the most concentrated amount but it is found throughout the plant. Mucilage acts as a soothing agent to calm irritated tissue. This is helpful in digestive system, for sore throats and for lung congestion. Fireweed also has antispasmodic properties, making it useful for asthma, coughs and intestinal spasms. Fireweed isn't just a medicine - she’s a food source too. Fireweed is considered to be a survival food because she's so abundant. In the Spring, you can eat the stalk. It will taste better and have more vitamins if you harvest them before the plant blooms. These young shoots are often called “wild asparagus.” You can eat the shoots raw, but they’re better steamed or highly cooked. The shoots will get bitter once the plant flowers. Just harvest them when the leaves are still close to the stem, pointing upwards. Snap the shoots off at the base, and use as an asparagus substitute After you’ve harvested the shoots, peel off the first layer because it can be kind of tough. Then you can steam the shoots or lightly boil them. This is good because the water helps to pull out some of the strong medicinal compounds. This makes it more of a food source instead of a medicine source. The shoots are very nutritious and are full of vitamin C, flavonoids, and beta-carotene. They are slightly mucilaginous, and you can taste a little “slipperiness.” This is soothing for your mouth. When you’re using fireweed as a food source, you don’t want too many of her medicinal compounds. We don’t eat medicine as food. We use medicine as garnish and flavourings for food. The leaves can be used in salads, soups, or stews. You can also use them in stir-fries. During the spring you can use the young leaves as a spinach substitute. The older the plant gets, the harder the leaves get to eat and the more bitter they are. The stem is a good source of carbohydrates once it has grown more, so around mid-summer. If you split the stem lengthwise with a knife, you can scrape out the inner pith. It’s very similar to cucumber and some people use it to thicken up stews. It is mucilaginous too. The flowers are totally edible too and can be used as garnishes to salads or summer rolls. You can also dry the flowers and use them in baking. In the “fireweed as food” section, I discussed how to use the shoots, leaves, and stem as food sources. I honestly don’t know much about how the roots are eaten, so I didn't include any of that. This section is for other uses of fireweed apart from food. Fireweed tea is very popular. You can harvest the leaves and then dry them to make tea. You can also wildcraft and dry the flowers for tea too. Fireweed flowers are great for making jellies, jams, and infused honey (even though I don’t eat honey because I’m vegan, but I know this is a popular thing). If you’re making fireweed tea, all you do is use a small handful of fresh leaves for 1 cup of boiled water. Let it steep for around 15 minutes. You can drink up to three cups a day. You can use either fresh or dried leaves for tea. The taste is pretty mild. In Russia, they make a fermented tea out of the leaves called kapoori. If you're using dried fireweed leaves, use 3 or 4 leaves for 1 cup of boiling water. Infuse it for around 5 minutes, then drink. Drink this tea frequently for diarrhea, or simply use it as a substitute for any other tea. Fireweed makes a great poultice. If you have a mosquito or wasp bite, or any swelling in general, a poultice can help. All you do is mash the flowers and leaves together with a bit of hot water. Place this fresh poultice on your wound then cover with a cotton cloth. This should help any stinging immensely. It’s very healing. If you get a bite when you’re in a forest or something, you can do the same thing. Just harvest a few leaves and flowers, but instead of mashing them together, put them in your mouth and chew them. Then just place the chewed poultice directly on your cut. It’s called a spit poultice. It’s very cooling, soothing, and healing. I did this the other day on my heel for a bite I got, and the results were incredible. Fireweed leaf spit poultice over some bug bites. Towards the end of summer, when fireweed goes to seed, you can use the seeds as a firestarter. You can also use these seeds to stuff anything that you would normally stuff with cotton. These cottony seeds are so abundant at the end of summer that you can harvest a large amount quickly and easily. Fireweed flowers can also be used to make an essence. Fireweed essences are a powerful aid for helping us connect to the healing energies of mother earth. Fireweed was traditionally used to make tonics or teas when she first emerges in the Spring. A leaf infusion was used by the eclectics for uterine bleeding and heavy periods. The fresh leaves were used as a poultice for ulcers. The contemporary American herbalist David Winston uses fireweed to treat candida overgrowth. Here’s a breakdown of some fireweed medicines and what each thing is beneficial for. Dried fireweed flowers and homemade fireweed syrup. This has nothing to do with plant medicine, but I found it really interesting. Because of how fast fireweed establishes on disturbed land, this plant can be used for land management purposes. Disturbances like fires and logging leave the land bare, without any vegetation. This causes all sorts of issues like erosion because there’s no root structure in the soil anymore. Fireweed is not only fire resistant, but she can recycle any nutrients that are left in the soil after a fire. She establishes root systems pretty quickly and this can prevent erosion. Reestablishment of vegetation is super important when disturbed land is recovering, and fireweed can help recover this land. This helps to provide further damage, she creates a blanket of healthy vegetation for animals to make new habitats in, and of course, she's amazing for pollinators. Fireweed can do this for any disturbed site, even old oil spills. Fireweed has been doing this for centuries. She's sometimes even called bomb weed because after the second world war bombings, she quickly cleared open spaces. She was also one of the first plant species to populate the wasteland following the eruption of Mount St. Helens. I hope this post taught you something about fireweed! She’s the perfect long-term remedy. Fireweed represents the promise that beauty is still possible after environmental destruction or even bodily sickness. When forests are damaged by fire or mass human-caused clear-cuttings, fireweed is the first plant to emerge and show the promise of recovery. She’s a great reminder that nature has a healing cycle too, just like us. Her lush, abundant fiery medicine mends the earth from shock and trauma, with her strong root system weaving together and anchoring the soil. She allows for the growth of new trees and other plants. Her tender leaves feed the deer, and her sweet blooming flowers provide nectar for insects all summer long. This is reason enough to love fireweed, but the fact that she soothes our bodies the same way she soothes mother nature’s inflammation makes me love her even more. The information provided on my website is not intended to diagnose or substitute any medical advice or orders given by a licensed healthcare professional.